My attention slips away pretty easily on a Fed day until the announcement is made and things really get moving. Hopefully later we’ll see some fireworks and get this market out of the recent trading range. In the meantime, we’ll keep our attention diverted and tend to some trivia! I noticed that King Kong comes out today on video – I haven’t seen it yet, but I’ll check it out! So, in honor of Jack Black, today’s trivia pertains to his 2003 performance in School of Rock. The first person to answer all 3 questions correctly will win a free T-shirt from TheStockBandit.com! 1. You must use the contact form when you submit your answer. 2. Include your name & mailing address when you submit your answer. 3. Only the first completely correct answer submitted will win a t-shirt. 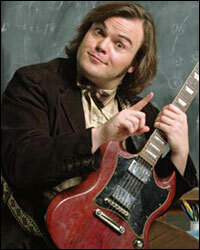 2) What is the name of Jack Black’s student band in the movie? 3) What is the name of Jack Black’s real-life band? If you know the answers, send me your name & address (and shirt size) via the contact form, and the first to correctly answer all 3 questions wins today’s t-shirt! Good luck! Coast to Coast, Congrats are in Order!